Alamo Pintado Equine was founded by Dr. Doug Herthel, DVM, and Mrs. Sue Herthel together in 1972. Combining a love for horses and passion for veterinary medicine, Alamo Pintado Equine remains a clinic dedicated to scientific advancement and exceptional care, and committed to the family of veterinarians and staff that work together to deliver successful outcomes for our patients. Alamo Pintado's roots begin in the humblest of places. 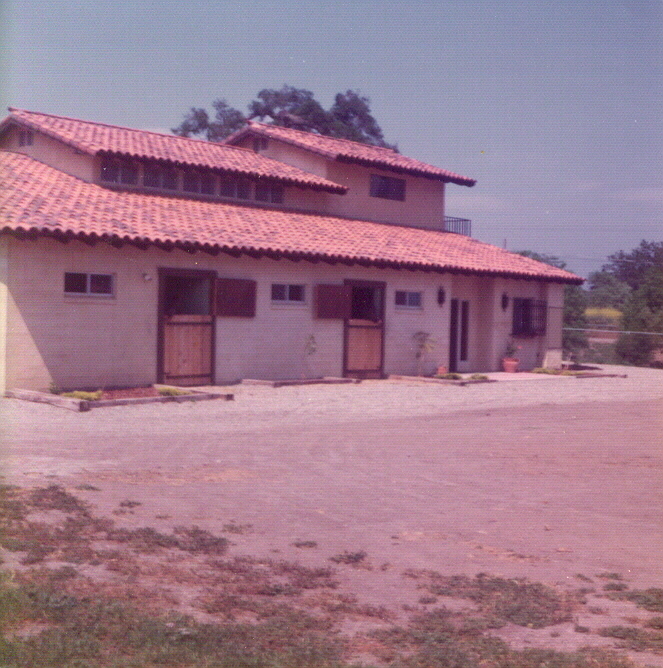 Long before our beautiful clinic, we started as a dream shared by Dr. and Mrs. Herthel during their time together at UC Davis, and evolved over the years into today's Alamo Pintado Equine. Big Boy was Dr. Herthel's beloved horse for 37 years, helping to foster a love for veterinary medicine. Big Boy remained with Dr. Herthel from his adolescence spent near Calabasas, California, to his time at UC Davis and on to Los Olivos, where Dr. and Mrs. Herthel still live to this day. Alamo Pintado wasn't always housed in the beautiful clinic we call home today. In the early days, Dr. and Mrs. Herthel operated out of a small house in downtown Los Olivos. Mrs. Herthel assisted Dr. Herthel with surgeries — often taking place on the front lawn — and together they served clients on California's Central Coast out of the back of an orange Chevy Vega. Dr. and Mrs. Herthel fell in love with the Los Olivos area on a trip back to Davis, California from the Los Angeles area. They were able to purchase a bare piece of land with the dream of someday building a clinic. As they worked from their makeshift clinic in Los Olivos, they planned the groundbreaking of what would become today's Alamo Pintado Equine. 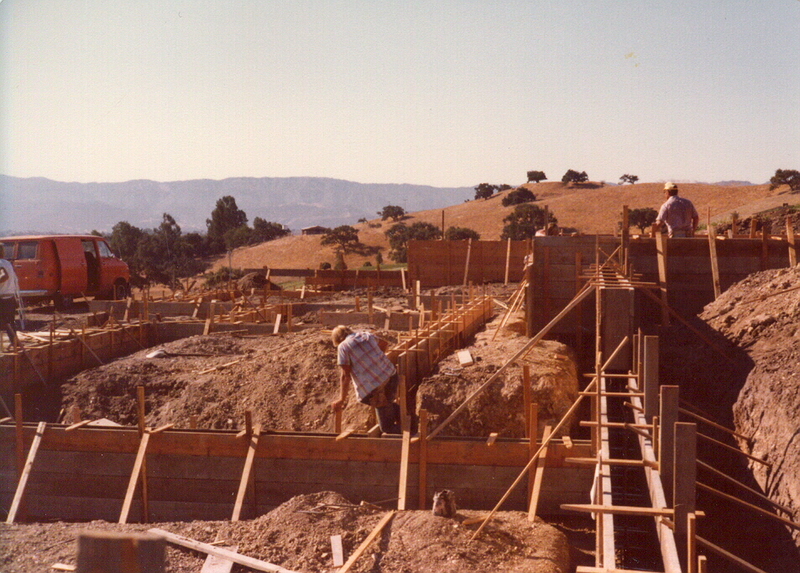 From his days at UC Davis, where Dr. Herthel contributed to the advancement of colic surgery techniques to his early years in Los Olivos and the rural Santa Ynez Valley, he and Sue worked toward building Alamo Pintado Equine into what it is today. The key to Alamo's success has been the dedicated team of veterinarians that have worked shoulder-to-shoulder with Dr. and Mrs. Herthel from the beginning. Many of the same faces still treat patients at Alamo Pintado with exceptional expertise today. Dr. and Mrs. Herthel were extremely proud to see their dream coming to life with construction of the first building at what is now Alamo Pintado Equine. Now a family of three with their eldest son, Mark, the Herthels lived on the top floor of the clinic while Dr. Herthel and Dr. Mark Rick treated horses on the ground floor. As the family grew with Dr. and Mrs. Herthel's youngest son, Troy, the original clinic building became dedicated wholly to the clinic, housing the first treatment rooms, ICU stalls, operating room and early imaging. Dr. Mark Rick and his wife, Kathy, have been an important part of Alamo Pintado Equine's heritage from some of its earliest days. Dr. Rick still practices daily at Alamo Pintado, and brings 40+ years of experience and deep knowledge of veterinary medicine and surgery. He and Kathy are a special part of the Alamo family. At Alamo Pintado our most important asset is our team. We call them family because they are family. They bring with them extraordinary medical minds, decades of experience, a thirst for innovation and a total dedication to the patients we serve. We're incredibly proud of the team that has helped create Alamo Pintado Equine Medical Center and the success we are able to bring to our patients. Doug Herthel lived an extraordinary life. Not simply due to the impact he made as a veterinarian, but more so because of the person he was. A thinker and a problem solver, Dr. Herthel had a brilliant mind and relentless passion for veterinary medicine, the patients he treated and the clients whose friendships he valued beyond measure. His life’s work was inspired by his endless curiosity, pursuit of science and deep love of the horse. His greatest source of joy and that which defined him, however, was the family he built alongside his treasured wife, Sue. Their family stretched beyond their two sons, Mark and Troy, daughters-in-law, Erika and Jacie, and grandchildren, Kendall, Ryder, Crosby and Piper, to include so many friends and colleagues. He was a man of great compassion, with a generous spirit and thoughtful approach to the way he practiced medicine and treated those around him. In Doug’s presence, new and old friends felt appreciated and valued. He was interested and engaged in whomever crossed his path, and his lasting impression will be in how those that knew him felt whenever he was there; safe, respected and treated with the utmost sincerity. Dr. Herthel grew up in the Calabasas area of California’s south coast, and developed a love of horses at a young age with inspiration from his childhood veterinarian. It was his first horse, a strapping sorrel gelding named Big Boy, that sealed Dr. Herthel’s fate and drove him further down the path that would define his career. Big Boy stayed with Dr. Herthel through his teenage years in Calabasas and on to UC Davis, where he attended college and went on to earn his Doctorate of Veterinary Medicine. It was there that he met his future wife, Sue, and began to build a storied career that would help to change the way veterinary medicine is practiced. 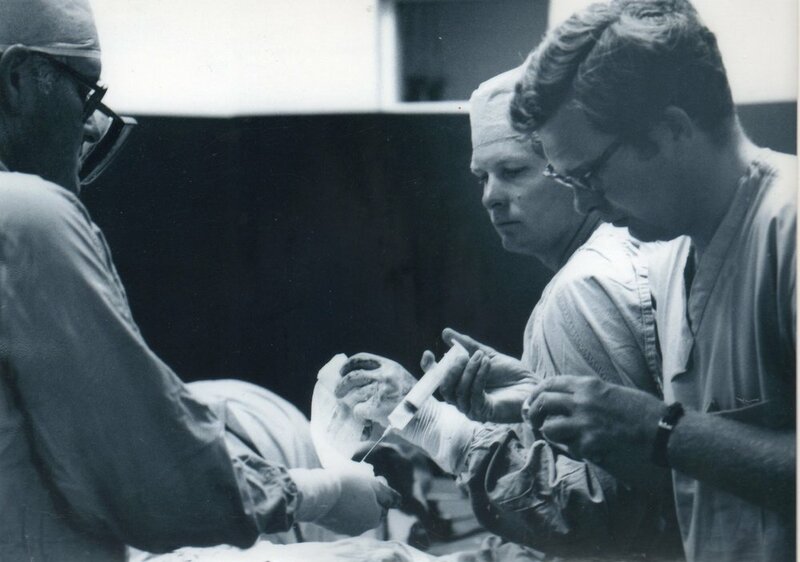 During his time at UC Davis, Doug was part of the team that conducted the first successful colic surgery, helping to take the odds of survival in cases requiring surgical intervention from 0% to above 90% today. It was Doug’s time at UC Davis that also spurred his fate in discovering the Santa Ynez Valley. As Doug and Sue traveled together back to UC Davis from Southern California, they stumbled upon the Santa Ynez Valley and Los Olivos. It was done; they instantly fell in love with the bucolic valley and decided this would be their home. They purchased the land that would one day become the Alamo Pintado Equine Medical Center, and spent any free time they had from UC Davis clearing the land in preparation for their dream. It was in 1972 when Dr. Herthel completed veterinary school and moved to Los Olivos with Sue to begin their veterinary practice. They were a team with a vision, practicing out of the back of their orange Chevy Vega. It was a leap of faith, with several months rolling by and no patients to work on. As luck would have it, their practice kicked off with their very first patient, a sheep in need of a veterinarian. From there, the Herthels slowly built what is now known as Alamo Pintado Equine. Sue was right by his side, and continued to be for the entirety of their lives together. She was his first surgical assistant, anesthetist, bookkeeper and business manager. He always said she had a work ethic like he’d never seen, and a kindness that assured their clients that their animals were in capable and loving hands. As their practice became more established, they broke ground on the first building of what is today’s Alamo Pintado Equine. It was a proud moment in seeing their long-held dream start to take shape. From there they slowly built a team of veterinarians, technicians and staff members that have stood as the backbone of the hospital. They’re a family, still practicing alongside each other, staying true to the foundation of service and sound medicine built by Dr. Herthel. It was Doug’s insistence from the beginning that Alamo Pintado would be a different kind of practice. Clients would experience a higher level of service than they’d ever seen before, patients would be kept in a peaceful and comfortable environment and the level of medicine practiced at Alamo Pintado would be exceptional. He approached challenges differently and always with a positive outlook, it was simply the way he was wired. When he recognized a disease or injury that was thought to be untreatable, he dove in with almost obsessive fervor. Doug and Sue’s living room reflected his intense passion, with carpet and furniture constantly covered in open text books and research papers with his notes in the margins. He was a relentless pursuer of a better way to treat, heal and care for the horse. Dr. Herthel’s mark will forever be seen in veterinary medicine, but getting him to talk openly about his achievements was near impossible. He was a humble man, always eager to give credit to the team he worked with and thought so highly of. Beyond his contribution to colic surgery and other innovations, Doug became the founding father of veterinary regenerative medicine, recognizing that the horse’s body, when given the right tools, can heal itself far better than any medical intervention. He worked tirelessly to develop this approach until its components were used as a mainstay in practices across the country, including his strong belief in the therapeutic capabilities of nutrition and the effects of hyperbaric oxygen therapy. Dr. Herthel was the first person to utilize adult stem cell therapy in horses, broadening the view of what was thought to be scientifically possible. From Kentucky Derby winners to donkeys and beloved family horses, Doug gave his best to every patient. He never stood still, was never deterred by a challenge and always looked for a better way. Doug lived a full and rich life, from adventures as President Reagan’s veterinarian to cherished days in his shared office at the clinic. He experienced much, met people who fascinated him, loved deeply and gave so much of himself to his family, profession and his beloved Santa Ynez Valley. He drew great pride in watching his sons succeed in their own right and in their own areas of passion. He founded Platinum Performance together with eldest son Mark in 1996, and through Mark’s leadership saw his work in nutrition grow to become a standard of practice in veterinary medicine. Youngest son Troy pursued the path of the man he admired most in the world, becoming an equine veterinarian and boarded surgeon, and now carrying on Doug’s legacy at Alamo Pintado Equine. While Doug was extremely proud of his sons and their wives, it was his grandchildren that brought him his greatest joy. “Poppy,” as he was known to them, was a devoted and constantly present grandfather to his four grandchildren, always acting as their strongest supporter and creator of fun. They adored him. Doug lived a life of great purpose, deep connections and strong convictions. He cherished his family, was passionate about his work in veterinary medicine and cared greatly for the people and horses he touched. He will be fiercely missed, never forgotten and celebrated as the extraordinary man he was.